While we talk a lot about what to write — More stories! Fewer words! Shorter sentences! — we don’t focus so much on how. Most of us were never taught to write. We were taught instead to rewrite: how to spell, punctuate and use the right grammar. As a result, we try to do three things at once: Figure out what to write, write it and get it right. No wonder writing is so hard! But if you’ll break your work up into three stages of the writing process and write step by step, you’ll write better, easier and faster. This process has saved me thousands of hours of writing time over the course of my career. Would you like to learn a system for Writing Better, Easier & Faster? 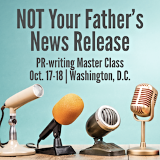 If so, please join me at our two-day writing-process Master Class on Sept.17-18 in New York. There, you’ll master a five-step creative process and a three-step writing process that will help you experience the joy of what creativity experts call “flow” — when your fingers fly across the keyboard to keep up with all of the great words pouring out of your head. Save $100 when you register by July 17.